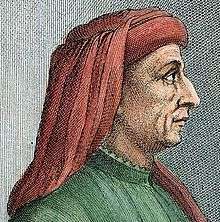 Filippo Brunelleschi (Italian: [fiˈlippo brunelˈleski]; 1377 – April 15, 1446) was an Italian designer and a key figure in architecture, recognised to be the first modern engineer, planner and sole construction supervisor. He was one of the founding fathers of the Renaissance. He is generally well known for developing a technique for linear perspective in art and for building the dome of the Florence Cathedral. Heavily depending on mirrors and geometry, to "reinforce Christian spiritual reality", his formulation of linear perspective governed pictorial depiction of space until the late 19th century. It also had the most profound – and quite unanticipated – influence on the rise of modern science. His accomplishments also include other architectural works, sculpture, mathematics, engineering, and ship design. His principal surviving works are to be found in Florence, Italy. Unfortunately, his two original linear perspective panels have been lost. Brunelleschi was born in Florence, Italy. Little is known about his early life, the only sources being Antonio Manetti and Giorgio Vasari. According to these sources, Filippo's father was Brunellesco di Lippo, a notary, and his mother was Giuliana Spini. Filippo was the middle of their three children. The young Filippo was given a literary and mathematical education intended to enable him to follow in the footsteps of his father, a civil servant. Being artistically inclined, however, Filippo enrolled in the Arte della Seta, the silk merchants' Guild, which also included goldsmiths, metalworkers, and bronze workers. He became a master goldsmith in 1398. It was thus not a coincidence that his first important building commission, the Ospedale degli Innocenti, came from the guild to which he belonged. In 1401, Brunelleschi entered a competition to design a new set of bronze doors for the Florence Baptistery. Seven competitors each produced a gilded bronze panel, depicting the Sacrifice of Isaac. Brunelleschi's entry, which, with that of Lorenzo Ghiberti, is one of only two to have survived, made reference to the Greco-Roman Boy with Thorn. Brunelleschi's panel consists of several pieces bolted to the back plate. Brunelleschi is considered a seminal figure of the Renaissance. Little biographical information about Brunelleschi's life exists to explain his transition from goldsmith to architect, nor of his training in the gothic or medieval manner or transition to the new classicism in architecture and urbanism. By 1400 there emerged an interest in humanitas, which contrasted with the formalism of the medieval period, but initially this new interest in Roman antiquity was restricted to a few scholars, writers and philosophers; it did not at first influence the visual arts. Apparently it was in this period (1402–1404) that Brunelleschi and his friend Donatello visited Rome to study the ancient Roman ruins. Donatello, like Brunelleschi, had received his training in a goldsmith's workshop, and had then worked in Ghiberti's studio. Although in previous decades the writers and philosophers had discussed the glories of Ancient Rome, it seems that until Brunelleschi and Donatello made their journey, no one had studied the physical fabric of these ruins in any great detail. They also gained inspiration from ancient Roman authors, especially Vitruvius, whose De Architectura provided an intellectual framework for the standing structures still visible. Brunelleschi's first architectural commission was the Ospedale degli Innocenti (1419–ca.1445), or Foundling Hospital. Its long loggia would have been a rare sight in the tight and curving streets of Florence, not to mention its impressive arches, each about 8 meters high. The building was dignified and sober; there were no displays of fine marble or decorative inlays. It was also the first building in Florence to make clear reference—in its columns and capitals—to classical antiquity. Soon other commissions came, such as the Ridolfi Chapel in the church of San Jacopo sopr'Arno, now lost, and the Barbadori Chapel in Santa Felicita, also modified since its building. 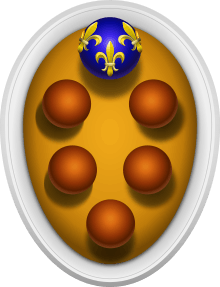 For both, Brunelleschi devised elements already used in the Ospedale degli Innocenti, and which would also be used in the Pazzi Chapel and the Sagrestia Vecchia. At the same time he was using such smaller works as a sort of feasibility study for his most famous work, the dome of the Cathedral of Florence. Santa Maria del Fiore was the new cathedral of the city, and by 1418 the dome had yet to be defined. When the building was designed in the previous century, no one had any idea how such a dome was to be built, given that it was to be even larger than the Pantheon's dome in Rome and that no dome of that size had been built since antiquity. Because buttresses were forbidden by the city fathers, and because it was impossible to obtain rafters for scaffolding long and strong enough (and in sufficient quantity) for the task, it was unclear how a dome of that size could be constructed without it collapsing under its own weight. Also, the stresses of compression were not clearly understood, and the mortars used in the period would set only after several days, keeping the strain on the scaffolding for a very long time. The dome, the lantern (built 1446–ca.1461) and the exedra (built 1439–1445) would occupy most of Brunelleschi's life. Brunelleschi's success can be attributed, in no small degree, to his technical and mathematical genius. 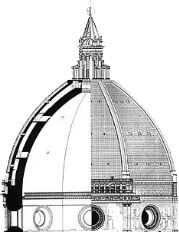 Brunelleschi used more than four million bricks in the construction of the dome. He invented a new hoisting machine for raising the masonry needed for the dome, a task no doubt inspired by republication of Vitruvius' De Architectura, which describes Roman machines used in the 1st century AD to build large structures such as the Pantheon and the Baths of Diocletian, structures still standing which he would have seen for himself. He also issued one of the first patents for the hoist in an attempt to prevent the theft of his ideas. Brunelleschi was granted the first modern patent for his invention of a river transport vessel. Brunelleschi also designed fortifications used by Florence in its military struggles against Pisa and Siena. In 1424, he was working in Lastra a Signa, a village protecting the route to Pisa, and in 1431 in the south of Italy on the walls of the village of Staggia. These walls are still preserved, but whether they are specifically by Brunelleschi is uncertain. He also was active briefly in the world of shipmaking, when, in 1427, he built an enormous ship named Il Badalone to transport marble to Florence from Pisa up the Arno River. The ship sank on its maiden voyage, along with a sizable chunk of Brunelleschi's personal fortune. Besides his accomplishments in architecture, Brunelleschi is also credited with inventing one-point linear perspective which revolutionized painting and paved the way for naturalistic styles to develop as the Renaissance digressed from the stylized figures of medieval art. In addition, he was somewhat involved in urban planning: he strategically positioned several of his buildings in relation to the nearby squares and streets for "maximum visibility". For example, demolitions in front of San Lorenzo were approved in 1433 in order to create a piazza facing the church. At Santo Spirito, he suggested that the façade be turned either towards the Arno so travelers would see it, or to the north, to face a large, prospective piazza. Brunelleschi is famous for two panel paintings illustrating geometric optical linear perspective made in the early 15th century. His biographer, Antonio Manetti, described this famous experiment in which Brunelleschi painted two panels: the first being the Florentine Baptistery as viewed frontally from the western portal of the unfinished cathedral, the other one is the Palazzo Vecchio seen obliquely from its northwest corner. These were not, however, the first paintings with accurate linear perspective, which may be attributed to Ambrogio Lorenzetti (Annunciation, 1344). The first Baptistery panel was constructed with a hole drilled through the centric vanishing point. Curiously, Brunelleschi intended that it only be observed by the viewer facing the Baptistery, looking through the hole in the panel, from the unpainted backside. As a mirror was moved into and out of view, the observer saw the striking similarity between the actual view of the Baptistery, and the reflected view of the painted Baptistery image. 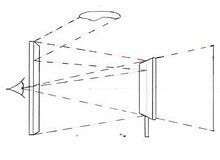 Brunelleschi wanted his new perspective "realism" to be tested not by comparing the painted image to the actual Baptistery but to its reflection in a mirror according to the Euclidean laws of geometric optics. This feat showed artists vividly how they might paint their images, not merely as flat two-dimensional shapes, but looking more like three-dimensional structures, just as mirrors reflect them. Unfortunately, both panels have since been lost. Around this time linear perspective, as a novel artistic tool, spread not only in Italy but throughout Western Europe. It quickly became, and remains, standard studio practice. Brunelleschi also designed machinery for use in churches during theatrical religious performances that re-enacted Biblical miracle stories. Contrivances were created by which characters and angels were made to fly through the air in the midst of spectacular explosions of light and fireworks. These events took place during state and ecclesiastical visits. It is not known for certain how many of these Brunelleschi designed, but at least one, for the church of San Felice, is confirmed in the records. Brunelleschi's body lies in the crypt of the Cathedral of Florence. As explained by Antonio Manetti, who knew Brunelleschi and who wrote his biography, Brunelleschi "was granted such honors as to be buried in the Basilica di Santa Maria del Fiore, and with a marble bust, which was said to be carved from life, and placed there in perpetual memory with such a splendid epitaph." Inside the cathedral entrance is this epitaph: "Both the magnificent dome of this famous church and many other devices invented by Filippo the architect, bear witness to his superb skill. Therefore, in tribute to his exceptional talents, a grateful country that will always remember him buries him here in the soil below." 1 2 Edgerton, Samuel. "Brunelleschi's mirror, Alberti's window, and Galileo's 'perspective tube'". ↑ The origins of the industrial property right. See: http://www.european-patent-office.org/wbt/pi-tour/tour.php Step 3.